Wednesday's news, bonuses and more for you! Yesterday we released another feature for students as part of Guide to Points and Miles for Students. This one looks at earning miles & points for Tuition payments. Read it here! Only 8 days left in our promotion where you can get a $250 Gift Card from Rewards Canada! Find out more here. 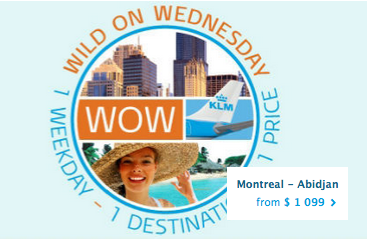 Its Wednesday so that means KLM's Wild on Wednesday is here! Today's offer is Abidjan for $1099 all in from the East or $1249 all in from the West. Book by Sep 24 for travel between October 16th and December 10th or between December 24th and May 6th , 2016. Find out more here!